There was a lot of news out of Vegas in the past year with established Sin City properties launching new points partnerships with the likes of Hyatt, Starwood and Marriott, so we asked TPG contributor Nick Ewen to cover the basics of these partnerships and how you can maximize each. As a former Las Vegas resident, I always love making it back to Sin City to visit friends and my old favorite haunts. However, until recently, travelers weren’t able to earn & redeem hotel points (and take advantage of elite status perks) for luxury stays on the famed Las Vegas Strip for the most part. That all changed last year, first with Hyatt and MGM’s new partnership that began last June followed by SPG and Caesar’s new relationship (which kicked in this past January). The arrival of summer means low season in Vegas (whatever you do, don’t believe the “dry heat” advocates…120 degrees is blazing, with or without humidity! ), so I thought it would be a good time to revisit these partnerships to help TPG reader’s maximize their earnings and redemptions. 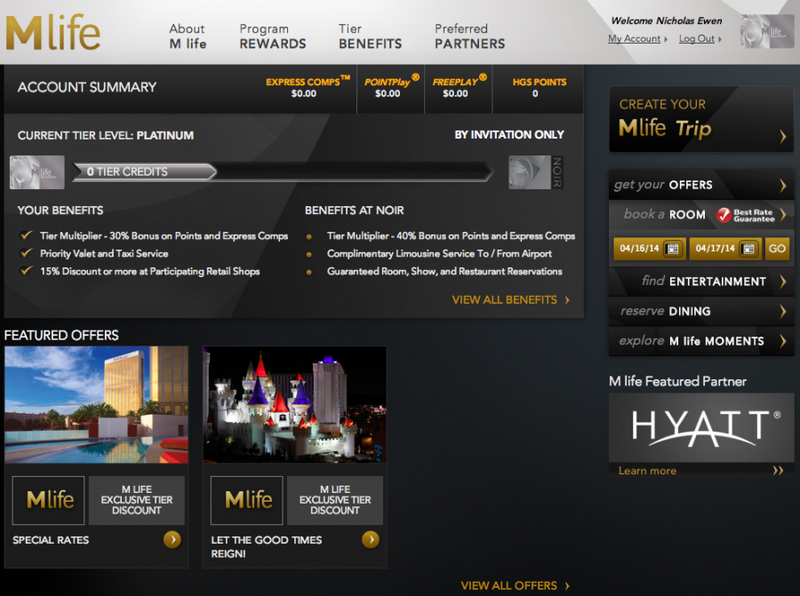 As TPG discussed in his above linked post, Hyatt Gold Passport now partners with M life, the rewards program of MGM Resorts International, to provide guests with a variety of benefits at certain Las Vegas properties: Bellagio, Aria, Vdara, MGM Grand, The Signature at MGM Grand, Mandalay Bay, THEhotel, The Mirage, Monte Carlo, New York New York, Luxor, and Excalibur. This includes earning points for paid stays, redeeming points for free stays, and taking advantage of certain elite reciprocity benefits. 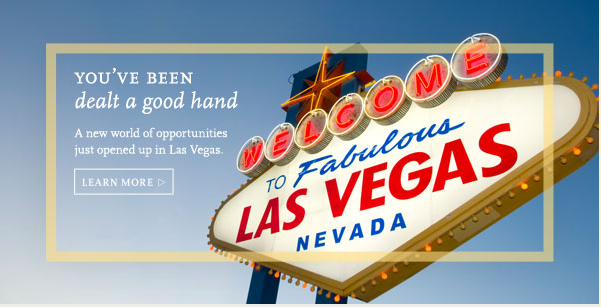 1) Earning: Hyatt Gold Passport members earn 5 points for every dollar of eligible spend at participating M life properties in Las Vegas, and Platinum and Diamond Gold Passport members will enjoy the same 15% and 30% bonuses (respectively) that they would at all Hyatts worldwide. Eligible spend is made up of two components: room spend (uncapped) and incidentals (capped at $5,000 per stay). It’s important to keep in mind that room spend is only eligible when booked through “official” Hyatt or MGM channels, not on award stays or third-party site bookings. However, even if your room rate is ineligible for earning points, you can still earn points on up to $5,000 of incidentals each stay. Unfortunately (or fortunately, depending on your gambling habits! ), casino spend is not eligible for earning Gold Passport points. In addition, you can earn points for up to three rooms per stay, as long as you stay in one of the rooms and pay for all three. 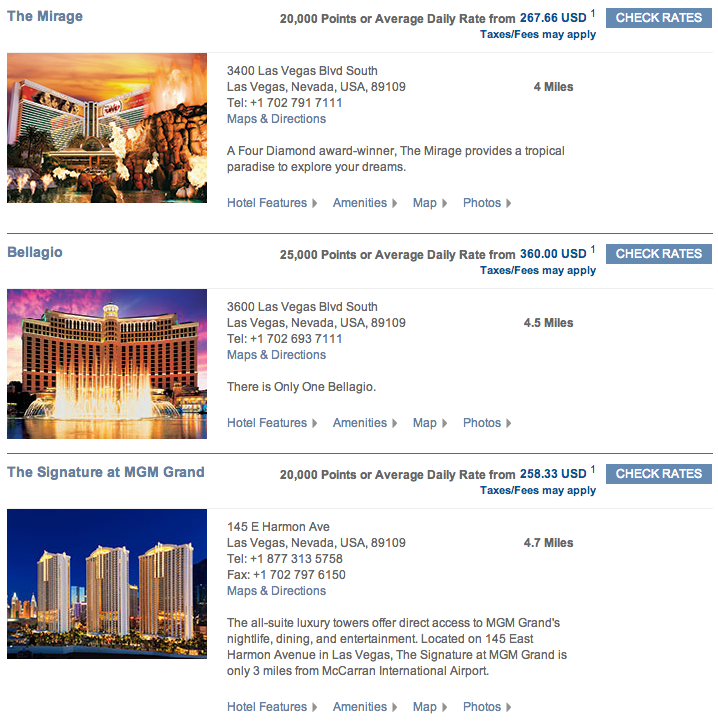 These paid stays also count towards elite status, and all of these properties should display when searching for hotels in Las Vegas on Hyatt.com. The other side of the partnership is for M life members that want to earn tier credits for staying at Hyatt properties; the earning rate is 8 credits for every dollar of eligible spend. Unfortunately, this must be selected in place of Hyatt Gold Passport points, and I’m going to guess that few TPG readers would give up valuable Hyatt points for M life credits. You would need to spend at least $3,125 at Hyatt properties to reach M life’s lowest elite level (Pearl), and personally, I would much rather have the 15,625 Hyatt Gold Passport points. 2) Redeeming: All Hyatt Gold Passport members can use their hard-earned points for free stays at the aforementioned participating M life properties. Fortunately, this process is incredibly easy and transparent (unlike SPG and Caesar’s…see below for more information). Each property has been assigned a category in the Hyatt Gold Passport program, and these can be accessed using their category look-up tool online. Even better? Because these properties officially “fit” within Hyatt’s Gold Passport program, you can redeem your free night certificates. This includes both the free nights earned as a sign-up bonus with the Hyatt Credit Card as well as the yearly anniversary certificate, and it also includes any free nights earned through their current “Endless Possibilities” promotion (though the latter two options, of course, are only applicable to the Category 1-4 properties listed above). Just like the paid nights, these award nights can be accessed on Hyatt.com by checking the “Show Hyatt Gold Passport Points” box from the search results page. Unfortunately, you cannot redeem more points for a swanky suite at these properties, nor can Diamond members use their suite upgrade certificates. Keep in mind too that all of these properties charge a daily resort fee ranging from $20.16 to $28, which includes amenities like internet access, local calls, fitness center access, and boarding pass printing privileges. The higher you go, the more benefits you receive, and the M life website gives a good breakdown of what you can get here. You’ll notice that M life elite member benefits include priority check-in, turndown service, room upgrades, and priority access to bungalows and spa reservations. 1) Join M life: In my conversations with friends visiting Las Vegas (who naturally want to stay on the strip), I have emphasized this new partnership and the earning/redemption potential. 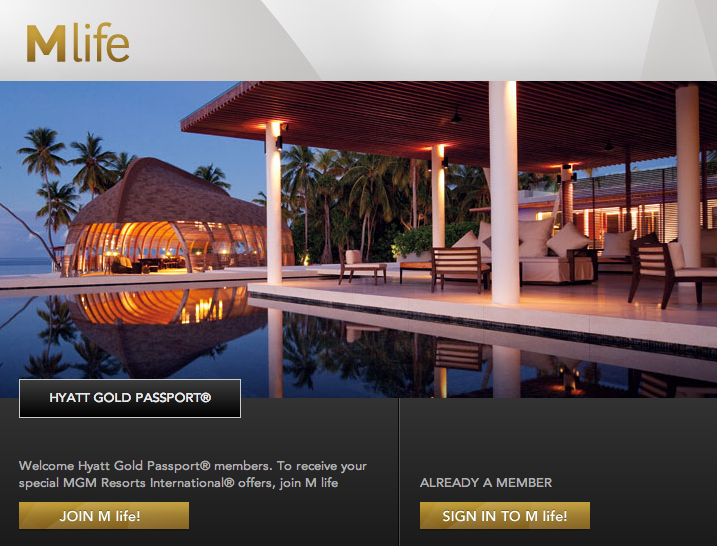 However, to take advantage of it, you have to be a member of both Hyatt Gold Passport and M life. This is listed in the FAQ page of the new partnership. To join, simply visit www.mlife.com and click “JOIN NOW” at the top right corner. The process is relatively quick and painless, and again, you HAVE to do this in order to be eligible to earn Hyatt points for your stays at M life resorts. 2) Match your Hyatt status: Once you are a member of both Hyatt Gold Passport and M life, be sure to opt-in for reciprocal status. This is also a very simple step. First, visit this page and click on the “opt-in” link (you may be asked to sign into your Hyatt Gold Passport account). From the next page, click on “SIGN IN TO M life” and once you enter your login information, your M life status should automatically update. As a Hyatt Diamond member, mine immediately jumped from Sapphire to Platinum, offering me additional discounts and on-property benefits that will come in handy the next time I visit Sin City! 3) Verify your accounts at check-in and notify the agent that you would like to earn Hyatt Gold Passport points: According to the FAQ, you must provide both your Hyatt Gold Passport number and your M life account number at check-in, and you should (of course) verify that both numbers are on your final hotel folio. In addition, you must let the check-in agent know that you would like to earn Hyatt Gold Passport points for eligible spend on the reservation. 4) Remember that these resorts are NOT actual Hyatts: Even though this new partnership works for earning and redemption, it’s absolutely essential to realize that these resorts are not actual Hyatts. Right off the bat, as mentioned above, this means that you aren’t entitled to the standard Platinum and Diamond benefits, but it also applies to the Hyatt credit card. If you choose to pay with this card, you would only receive 1 point/$ rather than the 3 points/$ at Hyatt properties. How do I maximize this partnership? 1) Book cheap stays during low season: As I mentioned earlier, Las Vegas during the summer isn’t exactly high season, but if you can stomach a few days of incredible heat (or just plan on soaking in the AC in your hotel! ), you can easily rack up elite stay credits on the cheap. For example, I see rates as low as $29/night for mid-week stays at the Excalibur in July, and even with the resort fees and other taxes, that still comes out to just $52.64/night. You can also check out the more luxurious properties on the cheap: I am seeing rates as low as $59/night for Monte Carlo, $75/night for the MGM Grand, and $100/night for Mandalay Bay. All of these rates are available on Hyatt.com, and believe it or not, they actually appear (for the most part) to match what third-party booking sites are offering. Remember that those bookings are not eligible for point earning! 2) Pay for other rooms: We all know that Las Vegas is a prime spot for bachelor/bachelorette/birthday/any excuse to go crazy parties, so if you are traveling with a group, offer to pay for multiple rooms and have your friends cut you checks for their portions. Not only can this help meet any minimum spend requirements to receive a sign-up bonus on a new credit card, but it also allows you to rack up even more Hyatt Gold Passport points. Remember that you can earn points on your room plus two others, as long as you pay for all of them. Unfortunately, only one room counts towards Hyatt elite status qualification. 3) Pay with a card other than your Hyatt Visa: This may not seem obvious, but since the M life resorts aren’t classified as Hyatt properties, you will not receive 3 points for every dollar you spend on the card. Instead, these expenditures are treated like any other purchase: $1 = 1 Hyatt point. As a result, you’d be much better off paying for these stays using a different card, ideally one that offers great return on everyday spend (like the Barclaycard Arrival or new American Express EveryDay cards) or one that provides bonuses for travel purchases (like the Chase Sapphire Preferred). 4) Use points for high season/popular events: One of the best things about this partnership is the sheer number of properties now open for points bookings. With 12 different resorts, the chances of ALL of them being sold out (as of right now) is slim. Take New Year’s Eve, for example. For a one-night stay this coming December 31st, one of the most popular nights in Las Vegas, there are still three hotels available: The Mirage ($439 or 20,000 points per night), Vdara ($459 or 20,000 points), or Aria ($574 or 25,000 points). In all three cases, you are getting better than 2 cents per point. While this is (obviously) an extreme example, be sure to check this option during other times, especially long weekends, the Consumer Electronics Show (January 6th – 9th this coming year), the Super Bowl, and March Madness. 5) Visit other M life resorts: The twelve participating M life resorts offer visitors a wide variety of accommodation options, but one of the best things about joining M life is that you can room charge eligible spend from any of them. Let’s say (for example) that you booked a room at one of the lower-end properties but wanted to splurge for a Cirque du Soleil show, or the terrific champagne brunch buffet at Bellagio, or maybe a casual bite at Burger Bar in Mandalay Bay (incidentally one of my FAVORITE dining spots in the whole city). Because these charges will post to your actual room, you will earn 5 points/$ (plus the 15% or 30% bonus if you are Platinum or Diamond, respectively). Remember that this still holds true even if your room rate is ineligible for points; eligible room charges can still earn Gold Passport points. The only possible exception to this would be for dining purchases this quarter on the Chase Freedom card, as those would also earn 5 points/$. For those cardmembers that also have an Ultimate Rewards account, these points have the added flexibility of being transferrable to not only Hyatt but other partners such as British Airways, Southwest, and Marriott. However, if you plan on eventually transferring them to Hyatt anyways, then charging them to the room is a better value proposition. 6) Get the Hyatt Visa: This card has been a terrific addition to my wallet. I used the sign-up bonus of two free nights (in a suite, thanks to my Diamond status) at the Park Hyatt in Istanbul, and with 3 points/$ spent at Hyatt properties, no foreign transaction fees, and a free anniversary night at a Category 1-4 property, for me, the $75 annual fee is a no brainer. However, this card is even more attractive given this new partnership, especially for anyone who visits Las Vegas even once every couple of years. It automatically confers Platinum status to the cardholder, which then allows you to opt-in to Gold status in the M life program. This is a pretty big step above the Sapphire M life status that a regular Gold Passport member receives; Gold M life members enjoy room upgrades, priority check-in and dining reservations, and buffet, café, and nightclub line passes. Definitely some nice perks, even if it’s just a weekend stay! 1) Earning: SPG members earn 2 Starpoints for every dollar of eligible spend charged to their rooms at the aforementioned participating resorts (up to a maximum of 100,000 Starpoints per calendar year). Just like Hyatt and M life, this applies to the SPG member’s room plus two additional rooms on the same reservation. Unfortunately, Gold and Platinum members do not receive additional point bonuses like they would at regular Starwood properties. However, both paid rates as well as rooms booked using Starpoints will count as nights towards SPG elite status qualification (up to a maximum of 10 nights per year). Unfortunately, these nights will not count towards lifetime status in the SPG program. Another added inconvenience is that you cannot use the main SPG website to book paid rooms; instead, you must go through Caesar’s or Total Rewards directly to be assured of booking an eligible rate for earning Starpoints. 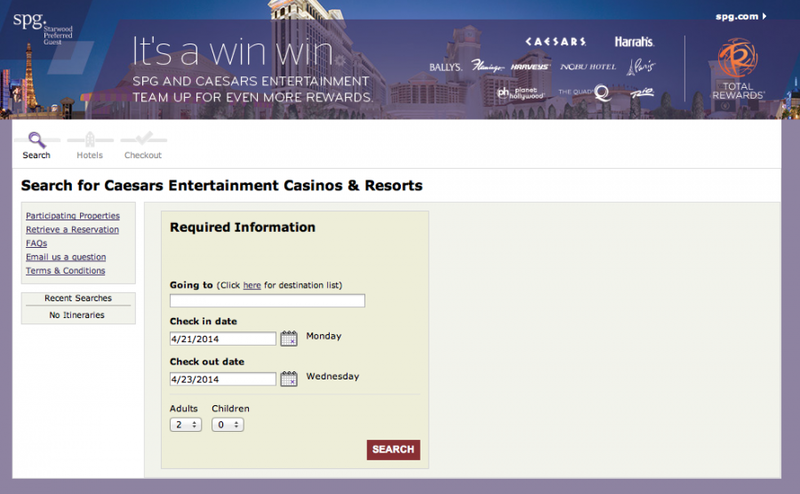 According to the FAQ page on Caesar’s website, ineligible rates include third-party bookings (like Expedia and Hotels.com) and conference rates. However, on a positive note, I am seeing that direct bookings with Caesar’s offers comparable (or even cheaper) rates than those through third-party vendors, though if you are attending a conference on a cheap rate, you may be out of luck. 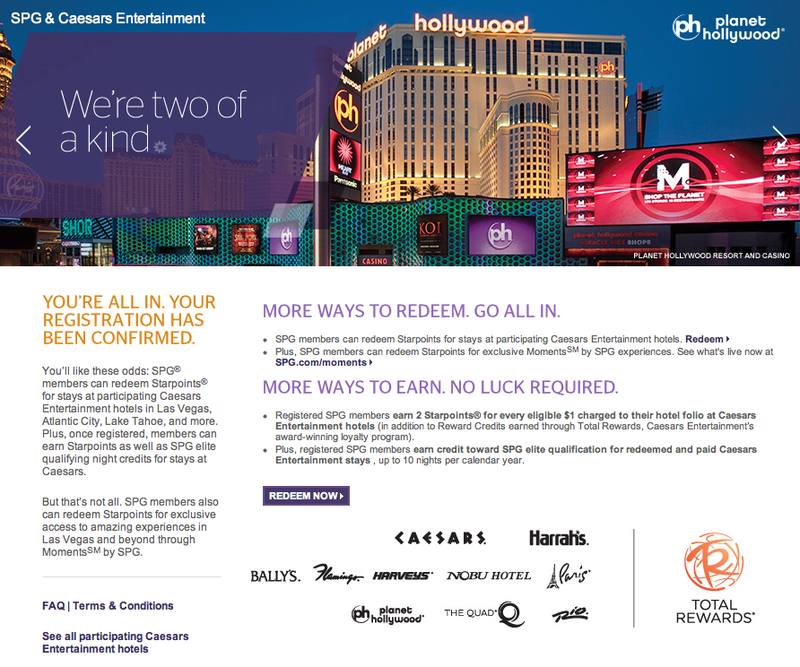 In addition, unlike the Hyatt-M life partnership, SPG and Caesar’s allow you to “double-dip” and earn both Starpoints and credits in the Total Rewards program for stays at any participating Caesar’s Entertainment hotel. There are two types of credits you can earn: Reward Credits and Tier Credits. Reward credits work much like hotel points or airline miles, in that they can be redeemed for merchandise, gift cards, travel, or even SPG stays! 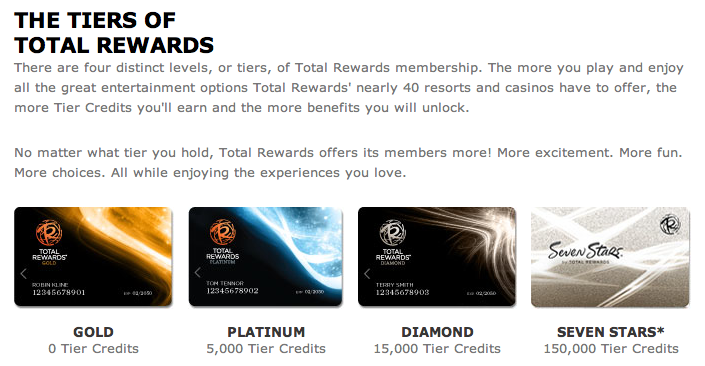 Tier Credits, on the other hand, function more like elite-qualifying miles; they can’t be redeemed for anything but instead can move a Total Rewards member towards Platinum (5,000 Tier Credits), Diamond (15,000 Tier Credits), or even Seven Stars (150,000 Tier Credits) status. In addition to earning 2 Starpoints for every dollar of spend, Total Rewards members also receive 1 Reward Credit and 1 Tier Credit for every dollar of spend. Members also earn additional credits for gaming, though the earning rate varies depending on the type of game, minimum bet, length of play, and numerous other factors that aren’t publicly available. Visit this site to learn more about earning and redeeming Total Rewards credits. This partnership also works a bit like SPG’s Crossover Rewards program with Delta, in that you can double-dip for Starwood stays as well. In addition to earning your regular Starpoints, you can also earn 100 Total Rewards Tier Credits for every stay (up to a maximum of 2,500 Tier Credits per calendar year). That maximum gets you halfway to Platinum status with Total Rewards. If you already have Platinum (or higher) status with Total Rewards, you can also earn 1 Reward Credit for every dollar spent at Starwood properties. 2) Redeeming: With this new partnership, Starwood Preferred Guest members can now redeem their hard-earned points at the 17 participating Caesar’s Entertainment hotels. Unfortunately, this process is not nearly as streamlined nor as transparent as it is with the Hyatt-MGM partnership. 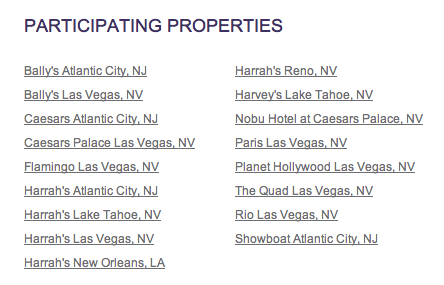 For starters, the main SPG website does not list these properties, so you would have to visit http://totalrewards.spg.com/Search/Default.aspx to search availability and see the corresponding rates. These rates vary SIGNIFICANTLY depending on the time of year, and it appears (not surprisingly) that it all comes down to money. For example, Memorial Day is coming up next month, and many travelers may be thinking about taking a long weekend away. If you plan on visiting Las Vegas, be prepared to shell out a TON of points. A three-night stay at participating Caesar’s properties ranges from 39,000 points at the Rio (13,000 points/night) to an astonishing 203,000 points (67,666 points/night). If you look for paid rooms on the Total Rewards website, the Rio is cheapest at $124.53/night, while Caesar’s Palace rings in at an outrageous $639.20/night. In all cases, the resorts generally offer a value of less than 1 cent per Starpoint, a pretty poor value. However, fast forward a couple of months for a mid-week stay in July (Monday the 14th through Thursday the 17th). The rates for this three-night stay range from 9,500 Starpoints for The Quad to 54,000 Starpoints for Caesar’s. Again, this appears to be tied to the revenue rates, as Total Rewards is offering The Quad for $23.39/night and Caesar’s for $129.40/night. In these cases, the redemption options are even WORSE, since the paid rooms are listed as “Sale” accommodations, so you are looking at roughly 0.7 cents per Starpoint. Notice that for each property, it claims that the exorbitant number of Starpoints “includes room rate and taxes for the entire stay.” You might be inclined to think that this covers resort fees, but unfortunately, that is not the case. When you click “SELECT” for your desired property, the next page reminds you that all guests are subject to a daily resort fee, which ranges from $20 to $25 (plus tax). The other aspect of redemption involves your Total Rewards points. Remember that you will earn 1 Reward Credit for every $1 of eligible spend at participating Caesar’s properties (in addition to 2 Starpoints/$). These credits are essentially a fixed value currency that can be redeemed during future stays. One credit = $0.01 cents toward eligible spend, so it’s basically a 1% rebate on everything charged to your room. There are also other redemption options available online; visit this link to see what else your Reward Credits can get you. 3) Elite Status: Here is where this partnership really falls short of Hyatt and MGM. In addition to not offering the elite earning bonus for paid stays, Starwood elites also receive no on-property benefits at the participating Caesar’s properties. However, up to 10 paid/award stays at these hotels will count towards elite status qualification with SPG, and all Total Rewards members will earn 100 tier credits for every SPG stay (up to 2,500 credits per calendar year). I certainly hope that this will change going forwards, as it would be nice to have some recognition (or at least some type of status match) when visiting these properties. 1) Join Total Rewards: This is the first (and most basic) step, and honestly, it should be a no brainer for anyone interested in visiting Vegas at some point and possibly staying at a Caesar’s property. It’s completely free, and in order to begin taking advantage of this new partnership (like Hyatt and M life), you must be a member of both programs. Joining is very simple; just visit www.totalrewards.com and click on “Join Now” underneath the password box on the main landing page. 2) Link your SPG and Total Rewards accounts: Much like SPG’s Crossover Rewards program with Delta, members need to link their SPG and Total Rewards accounts to begin taking advantage of the reciprocal earning and redemption options across the programs. This two is a very simple process; visit this link, sign in with your SPG credentials, and then enter your Total Rewards number to register for the partnership. Note that you MUST complete these first two steps at least 48-hours before checking out of a Caesar’s or SPG property in order to “double-dip” in both programs. In each case, the bonus Starpoints (for Caesar’s stays) or Tier Credits (for SPG stays) should post to your account 4 to 6 weeks after checking out. 1) Register: This is one way that the SPG-Total Rewards partnership stands above Hyatt and M life. The double-dipping is completely automatic once you have registered for the program. In other words, you don’t need to verify that your SPG number is linked to your folio at checkout, nor do you need to make sure that your Total Rewards number is linked for stays at Starwood properties. While this FlyerTalk thread has seen a few examples of stays not posting correctly, most reports seem to indicate that the reciprocal earning is working well. 2) Book cheap stays during low season: As I mentioned earlier, Vegas during the summer can be miserable, so if you want to make a quick trip to Sin City, you can score some fantastic deals at these properties, with even weekend rates falling into the “affordable” category. 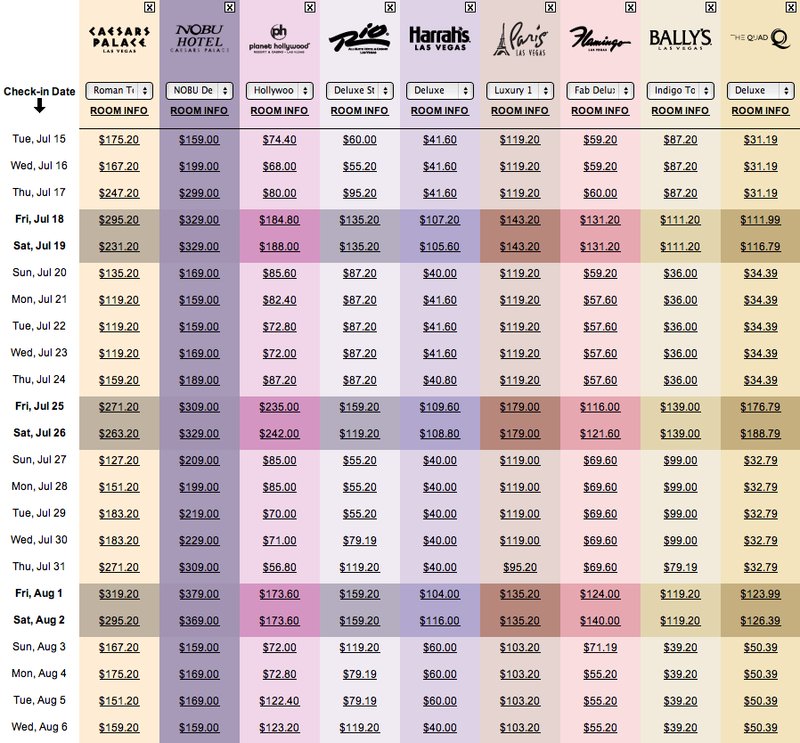 I am seeing mid-week rates in July and August as low as $40 for Harrah’s and $103.20 for Paris, while most weekend rates (aside from Caesar’s and Nobu) are still under $200/night. This can be especially helpful for Gold or Platinum requalification with SPG, though remember that a maximum of 10 nights will count towards elite status. 4) Go for Platinum status in the Total Rewards program: This may seem like chasing elite status just for the sake of elite status, but if you typically qualify for SPG Platinum by making 25+ stays every year and like visiting Las Vegas on a somewhat regular basis, this might be easier and more beneficial than it sounds. Remember that once you sign-up for the SPG-Total Rewards partnership, you will earn 100 Tier Credits for every Starwood stay, up to a maximum of 2,500 Tier Credits a year. This puts you halfway towards Platinum status with Total Rewards, and if you have a group trip planned to Las Vegas, it may be easier to earn those last 2,500 Tier Credits than you think. Let’s say that you are going for a long weekend with some friends, and you book three rooms at $200/night (and pay for them all). You will thus earn 3,600 Starpoints, three nights towards SPG elite status, 1,800 Reward Credits, AND 1,800 Tier Credits towards Status in the Total Rewards program. Then, just charge another $700 to the rooms and voila! Platinum status is yours. This comes with some privileges on property (view a complete list here), but most importantly, having Platinum status with Total Rewards means that you now earn BOTH Tier Credits (100 per stay) AND Reward Credits (1 per $) for stays at Starwood properties. Since each Reward Credit can be redeemed for $0.01 towards future Caesar’s stays, this offers another 1% rebate on Starwood stays. Not an astronomical discount, but every little bit helps! 5) Unless you absolutely, positively HAVE TO, do not redeem Starpoints for rooms: While I am curious to get your opinions on this and hear whether any of you have redeemed Starpoints for Las Vegas stays, I just can’t see any way that this makes sense. In my research, the best “value” I saw for these redemptions was just over 0.9 cents/point. As Brian has written about extensively in the past, Starpoints are one of the most valuable and flexible point currencies out there. Not only can they be redeemed for terrific properties, they can also be transferred to numerous airline partners (with a 5,000 mile bonus for every 20,000 Starpoints transferred). 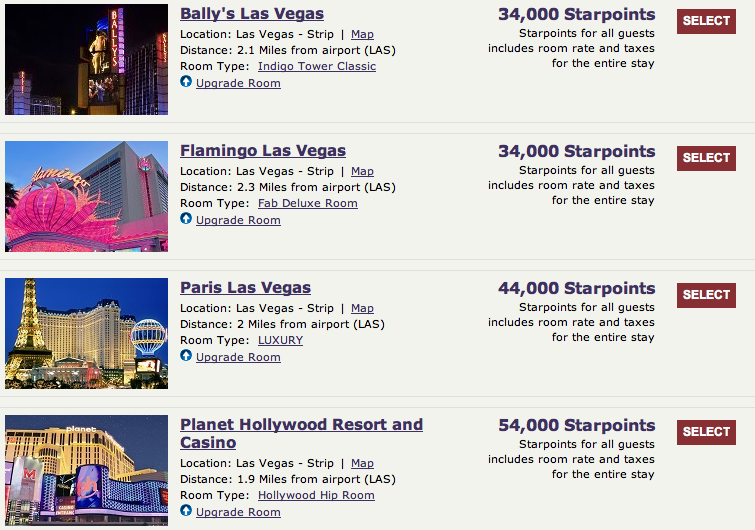 At 0.9 cents/point, those 20,000 Starpoints only get you ~$180 of accommodations at Caesar’s properties. I would argue that this is among the worst values out there. The Cosmopolitan is one of the newer properties in Las Vegas, located in a prime location just south of Bellagio. I visited this property a few years ago (though didn’t actually stay there), and I loved the multi-story chandelier bar and found the Wicked Spoon buffet to be one of the best in town. The best part about this property (for points & miles enthusiasts, at least) is that it is part of Marriott’s ever-growing “Autograph Collection” portfolio, meaning that Marriott Rewards members can earn and redeem points here just like they would at any other Marriott around the world. Unfortunately, this is a Category 9 property, requiring 40,000 – 45,000 points per night. You can search availability online at www.marriott.com, and it appears that most nights for the spring and summer are available. Just like Hyatt, I would strongly recommend checking the paid rate before using points, as cheaper nights still require the same number of points. The Venice-themed portion of Las Vegas Boulevard actually consists of two separate (but adjoining) resorts: The Venetian and The (slightly newer) Palazzo. TPG had the opportunity to stay at The Palazzo as an Intercontinental Royal Ambassador a few years back (read his review here), and these properties participate in the InterContinental Hotels Group (IHG) program as an “alliance” resort. Just like the Cosmopolitan, both of these properties show up when searching for hotels in Las Vegas on www.ihg.com, and their prices tend to be about the same. Reward nights are available at 50,000 points/night, and I am seeing standard rates as low as $135/night during the summer. Again, I would recommend using points only for the more expensive nights; 50,000 points for a $135/night room is not a very good use of points in my opinion! 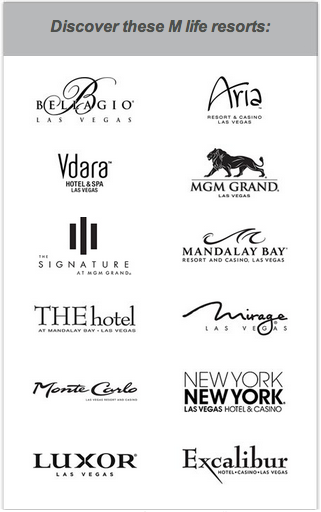 There’s no question that the Hyatt/MGM and SPG/Caesar’s partnerships have changed the value proposition for earning and redeeming points in Las Vegas, and I hope that these new relationships will expand and (ideally) spawn others (Hilton, are you reading this? I’m looking at you!). Just a note that when you book many hotels through American Express’s Fine Hotels & Resorts program for Platinum cardholders, not only do you get value-added perks like free breakfast and on-property credits to use at restaurants or spas in many cases, but these stays are also eligible to accrue miles and elite stay credit, so it’s worth looking into booking through there if you are a Platinum cardholder and triple-dipping on your benefits and earning. Have any of you experienced these partnerships yet? Please comment below with your experiences!